The FLIR Lepton 2.0 camera core is a long-wave infrared (LWIR) thermal imaging breakthrough in size, power consumption, and price. It currently packs a resolution of 80x60 pixels into a 8.5 x 11.7 x 5.6 mm package that draws only 150 mW nominally. The frame rate is 9 Hz at a spectral response wavelength range of 8 - 14 microns (nominal) and it can be purchased for under $200 in single quantities. Lepton 2.0 is the same thermal imager inside of the first generation FLIR One and the CAT S60 Rugged Smartphone. The new Lepton 3.0 with twice the resolution is available now in our store. Looking for a radiometric Lepton? The Lepton 2.5 is the only radiometric Lepton core available at this time. The FLIR Lepton is enabling new innovations in industry, science, smartphones, and medicine worldwide. We are proud to have enabled thousands of developers worldwide by being first to make Lepton available in sub-1000 quantities in 2014. We also aim to lower its technical barrier of entry with our custom hardware and open-source software and firmware. 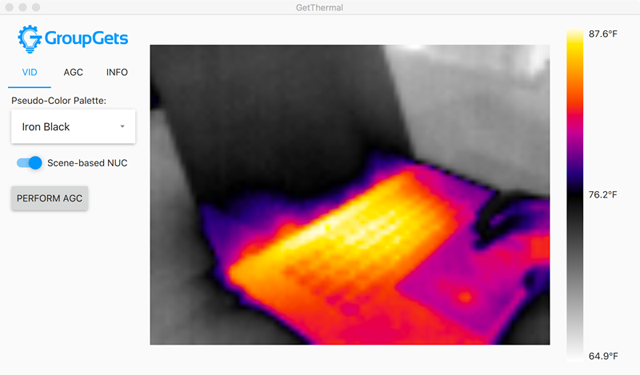 Below is a thermal image from Lepton using our latest, the PureThermal 1 FLIR Lepton Smart I/O Module, a hackable USB thermal webcam. 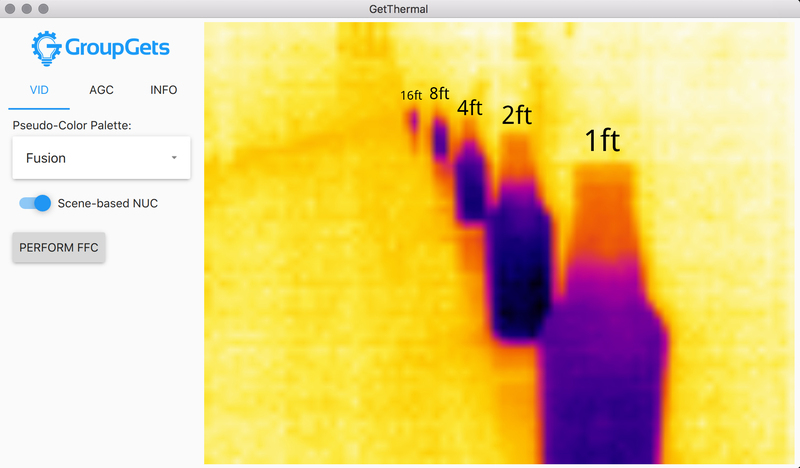 Why use a thermal imager? The list above barely scratches the surface of Lepton's potential which is what makes this product special. This technology used to only be available at 10x the cost and in larger package size, heavier weight, and greater power consumption making it not suitable for low-cost and portable solutions. 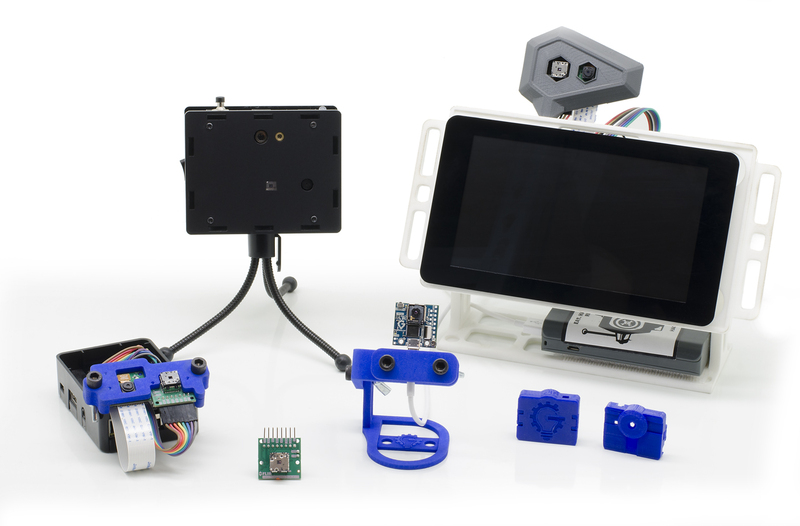 GetLab has designed multiple useful accessories for Lepton applications and development such as the classic lepton breakout board that makes Lepton's digital interfaces easily accessible and the PureThermal 1 FLIR Lepton Smart I/O Module (PT1) that takes Lepton development to a higher level with multiple I/O paths to command, control, and view Lepton imagery. We've also developed a plug-and-play Raspberry Pi 3 kit that allows you to overlay thermal images over the 8MP PiCam daylight images in real time. The kit has a custom (open-source) test program developed with our "pylepton" python library pre-installed to get you quickly up and running quickly. You can download and learn more about our pylepton library to make your own Lepton applications on the kit at our Github link below. Check out what goes down at FLIR's hack-a-thons. We had the pleasure of assisting with the SF '15 one and were blown away by the projects. All international customers that are ordering any Thermal Imaging Camera will be required to fill out an End Use Statement document before shipment. Once you place your order we will email you with the document within one business day. Important information for customers in Russia. Due to recent US regulations we are no longer able to ship FLIR thermal camera cores to these countries/territories. Any orders containing these products from these countries will be canceled and refunded. We are sorry for the inconvenience. We can only ship this product with a Lepton to North America, Australia, and the European Union Countries. Any orders for this product with a Lepton placed in a country other than those will be canceled and refunded. We are sorry for the inconvenience.